One thing I have really tried to do this year is help my students understand that "faster isn't always better"--and this is particularly true when reading challenging texts. We are in the midst of our historical fiction unit where are reading historical fiction now--and will be writing it next. We've done all the important work of studying different eras to help us understand our settings...and now I want my students to really dig into their characters to help us with our writing next week--where we will rewrite a key section of their book club books as if they were a different character telling the story. It's a ton of fun! 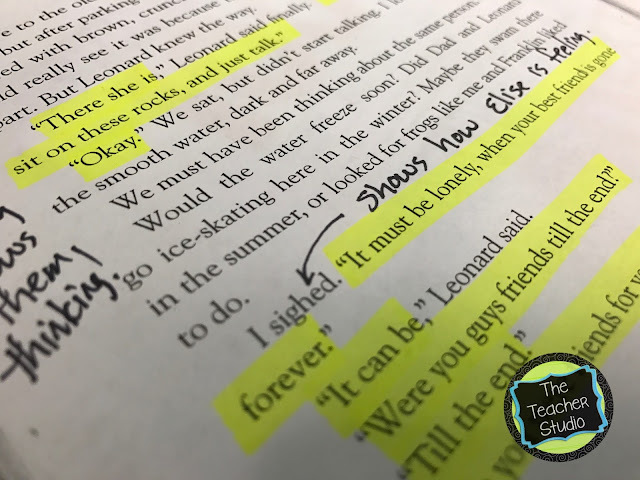 In the interest of true "close reading", we dug into a few pages from a recent read aloud to see what we could learn about WHAT the characters were saying--HOW they were saying it...and what we could learn about them or the story from their words. 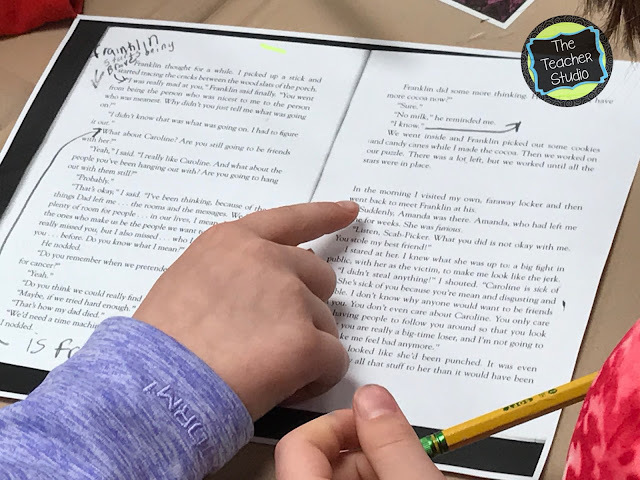 Again--I reminded students that sometimes reading is more than merely finding out what happens--it's UNDERSTANDING what happens and connecting to the characters. Attempt 1: I sent them off in trios to read the page and to "notice" the dialogue. I encouraged them to interact with the text--to underline, highlight, add annotations, and so on. They got to work right away and I circulated...but I noticed something. Although they were FINDING the dialogue, they were talking about the EVENTS. I let them work a little bit longer, then I threw the text under the document camera and we did some sharing. I got a few "a-ha' moments when I started to get after that initial direction--"Find out WHAT the characters were saying, HOW they were saying it, and what we could learn from it. I sent them back to their groups...discussions got more focused. After a while, I could tell that we still weren't getting deep enough so I grabbed another section of text and put it back under the document camera and we really picked apart the first few paragraphs. I read aloud slowly, paused for some think time, and asked students to raise their hand if they had anything to say about WHAT was said, HOW it was said, or any insights they had after I read it. 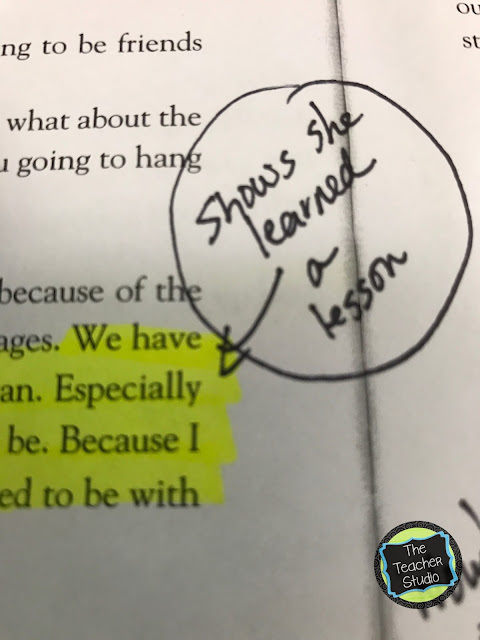 Along the way, I started to highlight the actual dialogue to separate it from the descriptive narration, and we started to notice some things--first, the words the author has the characters speak are important. "It must be lonely, when your best friend is gone forever." We sat, but didn't start talking. I looked at the smooth water, dark and far away. We talked about what NOT talking told us...about how the characters were being reflective...and thoughtful...and calm. As we worked our way through the rest of the second text, we noticed all the different things characters' words "taught" us about them...and how different the text would have been if the author simply TOLD us these things as a narrator might. 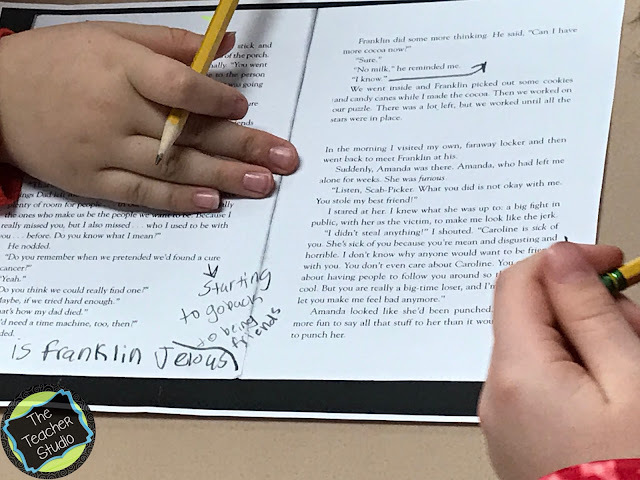 I think the most powerful thing about the lesson was how empowered my students felt...the felt like "grown up" readers who had the power to think deeply and really think about the characters--and what they believed the author was trying to do by carefully choosing the words to have the characters speak. I can't wait until we start our own writing so students can try their own hand it this! 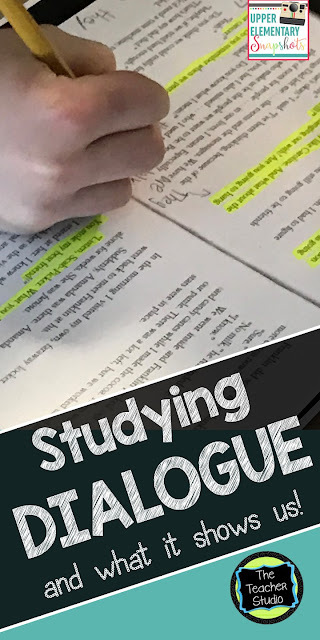 We learned how to write dialogue earlier this year, but I'm going to repeat my lessons with a new lens--what as authors are we trying to SHOW about our characters. I'm hoping the dialogue my students write to enhance their historical fiction stories will be more meaningful and relevant than the work they did earlier this year. Here are the tools I used then if you want to take a peek! Thanks for stopping by! Give this lesson a try and see what you think!